A fresh inquest into the death of an army recruit will examine whether he was bullied and harassed at the army base before he died. 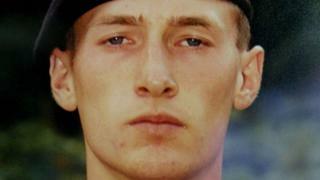 Pte Sean Benton, 20, was found with five gunshot wounds at Deepcut Barracks, in June 1995. His death was originally recorded as suicide, but a second inquest was ordered after a campaign by the family. Its scope has been widened to look at all the circumstances of the death of the soldier, from Hastings, Sussex. A pre-inquest hearing at the Old Bailey heard the full inquest, expected to be next January, would look at how Pte Benton died and whether there was "any third party action". Pte Benton's "state of mind" will be probed, as well as how he was assessed and disciplined. In addressing a 10-point list, the inquest will also look at whether he was "subjected to bullying and harassment". The court heard the soldier's family wanted a jury because of concerns questioning of retired sergeant Andrew Gavaghan may be curbed. For the family, Paul Greaney QC said: "There will be an attempt made on behalf of Sgt Gavaghan and MoD [Ministry of Defence] to restrict questions of his conduct only in respect of Sean himself. "On behalf of the family, our submission is we must examine allegations of abuse or bullying of any recruit, not just Sean." Nicholas Moss, for the MoD, stressed the officer would not be on trial. Coroner Peter Rook QC said he would rule on whether a jury was needed in July. Pte Benton's family have campaigned for years for a full investigation into his death amid claims he suffered prolonged bullying. Represented by human rights group Liberty, Pte Benton's sister Tracy Lewis and his twin Tony Benton applied for a new hearing after using the Human Rights Act to access evidence held by police. Their mother Linda, who also fought to see evidence about the circumstances of her son's death, died in 2015.